Losses can be the gifts that keep on giving when you make your money the way Donald Trump does. The bigger his loss, the lower his taxes. 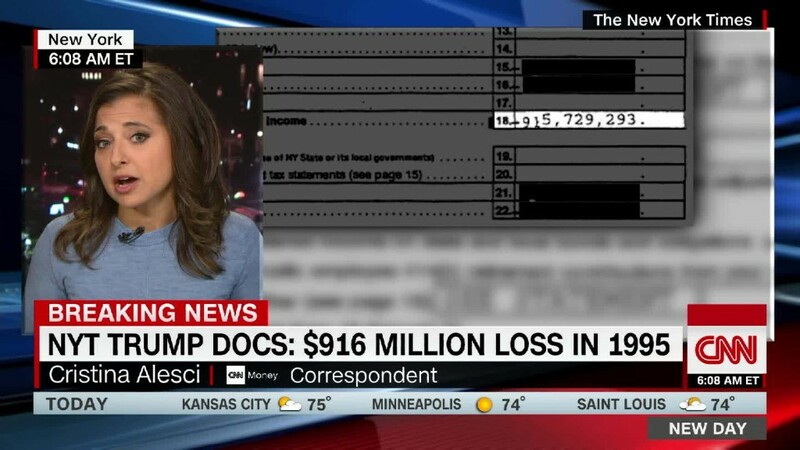 Trump claimed a $916 million loss in 1995, according to a few pages from his state tax returns obtained by the New York Times. Because of how Trump structured his businesses and because of the vast array of tax breaks available to real estate developers, it's a loss that he could have used to reduce the income tax he might otherwise owe. CNN has not independently verified the authenticity of the documents published by the New York Times. And several facts aren't clear, according to Steve Rosenthal, a tax lawyer and senior fellow at the Tax Policy Center: For example, it isn't known which Trump businesses drove the loss, or when the loss occurred -- whether in 1995 or in prior years. But if the goal is to pay as little in taxes as possible, one thing working in Trump's favor is that he sets up most of his business enterprises as limited liability corporations and partnerships. As a result, he would have been allowed to apply a loss from any business he actively managed to offset the taxable profits he earned from his other businesses. In addition, as a real estate magnate, Trump has a slew of other completely legal tax breaks available to him. Among them, he is allowed to deduct the interest on loans used to finance the purchase and development of properties. He can deduct the operating expenses and maintenance costs of his properties. And even though the market value of his property appreciates over time, for tax purposes he's allowed to write down the value of it over many years for wear and tear. When he wants to get rid of a property, he may be able to defer capital gains taxes owed by swapping it for a similar property within a given period of time. Such a broad menu of tax breaks goes a long way in explaining how someone like Trump - who may make tens if not hundreds of millions of dollars annually -- may be able to pay very little if anything in federal or state income taxes in a given year. In a statement, the Trump campaign said the GOP nominee has paid hundreds of millions of dollars in other taxes, including property and real estate taxes. It also said he has "a fiduciary responsibility to his business ... to pay no more tax than legally required." Without seeing his actual tax returns, it's impossible to say what Trump's tax burden has been in recent years, or how long he was able to use that $916 million loss to offset other income taxes. But if it turns out he owed nothing in federal income taxes, he wouldn't be alone. The Tax Policy Center estimates that this year 44% of Americans will not end up owing federal income taxes. The only difference: Most of them are middle- to low-income.